There's no need to wait days or weeks for your new iPad Pro to arrive. Apple's retail locations now have the device in stock; just walk into a store and leave with your new tablet in hand. If you were looking to get your hands on a new iPad Pro, but weren't able to pre-order one last week, I've got some good news for you. Both 10.5-inch and 12.9-inch iPad Pro models are now available from Apple Stores nationwide, so you can just walk into a location and walk out with your new device. In-store pickup is also available. 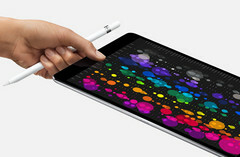 You can check online which Apple Stores have the iPad Pro in stock and order yours directly from the web, then drop by to pick it up at a time convenient to you. Finally, pre-orders for the iPad Pro should be arriving no later than today, June 13, which is the estimated delivery date for most customers. The new iPad Pro starts from $699 for the 10.5-inch 64 GB model, and $799 if you want the larger, 12.9-inch version. Of course, choosing any of the two models with a larger storage capacity increases the price—substantially if you go for the 512 GB option. As for what you get with each iPad Pro, both models feature Wi-Fi or LTE-capable options. The smaller iPad uses a 2264 by 1668 display, while the larger model increases the resolution to 2732 by 2048. Both screens feature a wide color, True Tone display for rich and accurate colors, as well as ProMotion technology that provides a fluid and more responsive feel. A 64-bit A10X Fusion processor is found in each iPad Pro alongside 4 GB of RAM. A 12-megapixel main camera capable of 4K video recording is located on the rear of the device; the iPad Pro's selfie camera captures more modest 7-megapixel photos and 1080p video. For a more complete look at the new iPad Pro's specs and features, visit Apple's official iPad Pro website.